ParaNorman Movie Trailer. Kodi Smit-McPhee, Tucker Albrizzi, Anna Kendrick, Casey Affleck and Christopher Mintz-Plasse lend their voices to the 3D stop-motion zombie comedy. 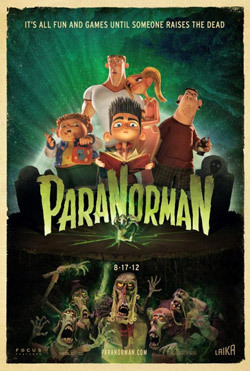 Watch the movie trailer for ParaNorman below. A misunderstood boy named Norman (voiced by Kodi Smit-McPhee) who can speak with the dead, takes on ghosts, zombies and grown-ups to save his town from a centuries-old curse. MPAA Rating: (PG) for scary action and images, thematic elements, some rude humor and language.